Black and white negative of a photograph of the members of the Whitby Cricket Club circa 1888. There is a tent and fence behind the team members. Back row: John Tait Mathison, second from left. Front row: Fred Hatch, second from left and Arthur Thomas Lawler, second from right. 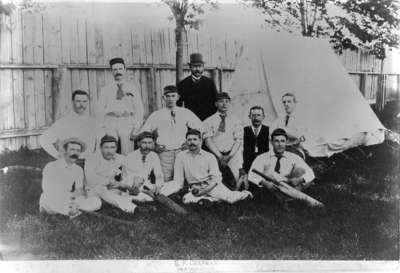 The Whitby Cricket Club was active in the 1880s and 1890s. Whitby Cricket Club, c.1888, G.F. Chapman. Whitby Archives 21-008-001.